Fight for justice as you attempt to rid the nation of evil. Click here to play! Join the most patriotic warrior, Captain America, for an incredible slot machine experience loaded with real cash jackpots! Play this five-reel slot across 25 pay lines, with the more coins played increasing your payout odds on winning combinations. Captain America is a simple of hope, virtue, and patriotism, as well as being a pretty handy Substitute that can replace any other symbol except the Scatters. If you manage to spin up five of him in one spin on any active pay line, you will find yourself with 12500 times your original wager. Scatters can be found anywhere across the reels, and will pay out according to the number you spin up each time. Enemies, Guns, and Top Secret Documents will all earn you a stack of cash if you spin up three or more in any one spin. Play Captain America today and save the world from destruction! 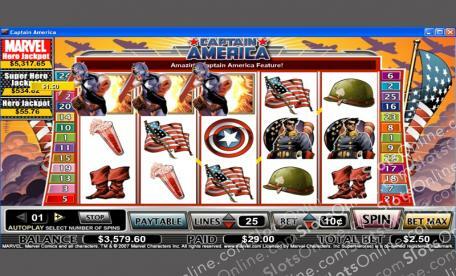 The Captain America logo is Scattered and will allow you win when they appear on any pay line. Up to 100 times your original stake can be won. Captain America is the Substitute symbol and can be used instead of any other symbol except Scatters. Also, 12500:1 are the odds on five of them appearing at once.